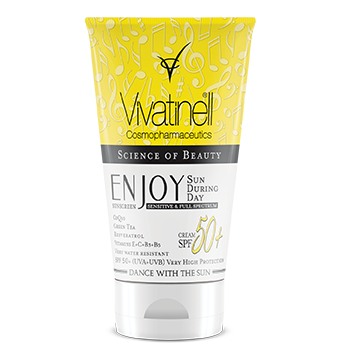 Enjoy Sun During Day Sun Creams offer high protection against both UVA and UVB with a high-tech formulation that utilizes nano particules titanium dioxides. Although conventional sun creams easily clear from the skin and require frequent re-application as rubbing, sweating and swimming, Enjoy Sun with nano particules of titanium dioxide mostly does not require re-application when properly applied to skin. Enjoy Sun differs from the all conventional sun creams with its special derma-nutrient content including vitamins, minerals, natural oils and anti-oxidants. Enjoy Sun During Day products protect you from the damaging UVA and UVB rays of sun light with broad spectrum sun filters. While UVA rays cause skin cancer and wrinkles, UVB rays will burn your skin. An effective sunscreen will protect your skin from both. UVA rays have been shown to penetrate the under layers of the skin where they can cause significant damage contributing to the skin's aging. Nano particles of Titanium Dioxide and Organic Sun Screens offer a high protection from UVA and UVB radiation of sun light. Special Formula of Enjoy Sun Cream SPF 50+ provides all day ultimate sunlight defence and makes it resistant to sweating, swimming. Dermanutrients Panthenol (Vitamin B5), Niacinamide (Vitamin B3), Vitamin E, Vitamin C, Allantoin, Bisabolol, Resveratrol, Green Tea EGCG rich Extract, CoQ10, Licochalcone A, Soy and Jojoba Oils moisture, soothe and care the skin. Ingredient rich formula provides intensive care and hydration to sun sensitive skin. Nano particles of Titanium Dioxide and Organic Sun Screens offer a very high protection from UVA and UVB radiation of sunlight. Special Formula of Enjoy Kids’ Sun Cream provides all day long very high protection and makes it resistant to sweating and swimming. Special dermanutrients Panthenol (Vitamin B5), Niacinamide (Vitamin B3), Vitamin E, Vitamin C, Liquorice, Green Tea, CoQ10, Allantoin, Resveratrol, Bisabolol, Lemon and Jojoba Oils moisturize, soothe and care the skin. © 2015 Enjoy Sun. All rights reserved.